Here is the fourth and final card from the September Make and Take! This one features the lovely Wondrous Wreath bundle to make a fall wreath. Crumb Cake card stock 4-1/4" x 11", scored at 5-1/2"
Early Espresso card stock 3" x 5-1/2"
Pool Party card stock 2-3/4" x 5-1/2"
Very Vanilla card stock 1-1/4" x 2-3/4"
Very Vanilla card stock 3-1/2" x 3-1/2"
Start off by folding the Crumb Cake card stock on the score line. Next use the Hardwood stamp on the Pool Party card stock in Coastal Cabana ink. I know, I know.... this is actually a retired background stamp, but I just love it! They were wrong to get rid of it! I just... can't... quit... using it! Okay, back to the card. Stamp the greeting from Sassy Salutations onto the small piece of Very Vanilla card stock in Crushed Curry ink. Use glue stick to adhere this onto the bottom of the Pool Party card stock. Glue the Pool Party layer onto the Early Espresso card stock. Now wrap your beautiful Mossy Meadow ribbon around the panel covering up the top of the Very Vanilla card stock and tie the ribbon into a knot. Use Paper Snips to trim the ends of the ribbon nice and neat. Then glue this panel onto the card front with more glue stick. Next up is the wreath! Take the larger piece of Very Vanilla card stock and use a pencil or pen to place a mark in the middle of one of the sides. That mark will be where you line up the little tab on the stamps and on the framelits. So stamp the full wreath image in Crushed Curry ink. Then stamp the second image with just a few leaves in Tangelo Twist ink. Dry the ink real quick with your Heat Tool then rub your Embossing Buddy all over the card stock. Stamp the berries or dot image onto the wreath in Versamark ink. Cover the stamped berries with Gold embossing powder, tap off the excess, and heat it with your Heat Tool until it's nice and shiny. Now take your wreath to the Big Shot and use the wreath framelits to cut out the shape. Stamp the bow image onto a scrap of Mossy Meadow card stock in Mossy Meadow ink. Cut out the bow with the matching framelit then glue the bow onto the wreath. Add a large pearl into the center of the bow. 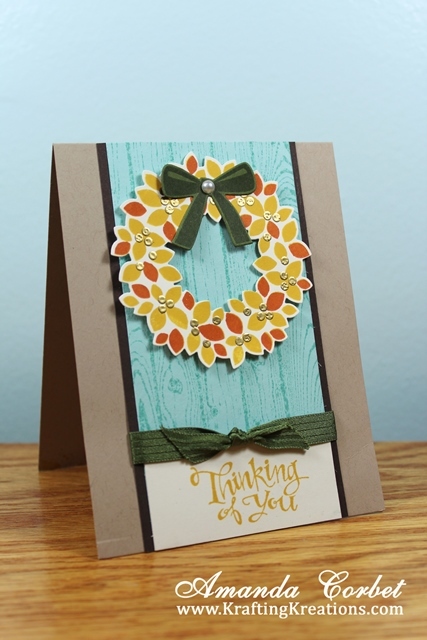 Finally, stick the wreath onto the card front with a few Stampin' Dimensionals. That's it! 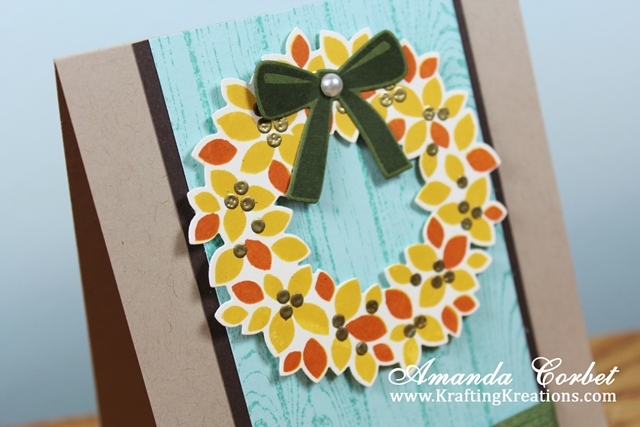 You now have a beautiful fall wreath card!